For many non-Christians, Good Friday seems to come across as dark humour in bad taste. It would seem so if you believe that it is vulgar to put the bodies of the deceased on display in a theatrical manner? Many of you may remember Monty Python’s 1979 irreverent satirical comedy, the Life of Brian, especially the final scene, where the protagonist, a guy who lives next door to Jesus, is mistaken as the Messiah and thus sentenced to a long and painful death. It is at this moment where the audience is treated to a combination of both the horrifying image of crucifixion, but with the audio fluffiness of a bunny. 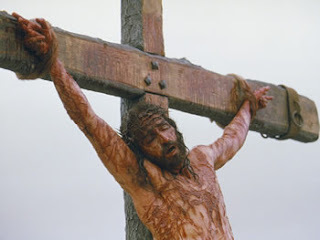 His fellow sufferers who have been crucified on surrounding crosses break into song with the immemorial, “Always Look on the Bright Side of Life,” an ode to life being a joke and death an even bigger joke. A 2014 survey showed that this was the most popular song at British funerals. Nothing strange about this because isn’t humour an ancient tool for subverting tragedy. Parody and satire persuade audiences that even the greatest of grief can be made comical. Art and literature vicariously teach audiences to laugh at their own pains and thus grow beyond them. The Italian Renaissance poet Dante Alighieri wrote a fanciful account of his own journey into Hell in three parts known as the Divine Comedy. I have to confess, I have not read the entirety of the Divine Comedy. I’ve only read bits and pieces of the bits and pieces. But of the parts that I’ve read, I would be hard pressed to describe the work as at all humorous. There is no satire, no parody, no slapstick, no verbally-depicted sight gags. There are no punch lines. Which leads one to wonder—why did he call it a comedy? It is tempting, then, to describe the Passion narrative, such as we have read today from St John’s gospel, as a tragedy. It has a highly dramatic plot, a feature which is intensified by the way we read it during Holy Week. It is a story filled with injustice, misunderstanding, and human weakness. Political and spiritual forces combine with random circumstances to railroad an innocent man into a death which seemed to everyone—friends and enemies alike—to bring a brilliant career to an abrupt and premature conclusion. If that isn’t tragedy, what is? Finally, even though Jesus has emptied himself and taken the form of a servant and become obedient unto death on the cross, he is not ultimately conformed to the shape and the demands of his suffering and death. He enters the jaws of death and it is death that is changed, not Jesus. In his utter humiliation, Christ has won for us honour and glory. In his total alienation, he has brought about our reconciliation with the Father. And finally, in his death, he won for us the gift of eternal life. We will soon move from the Liturgy of the Word to the Rite of Veneration of the Cross. We do so not because we are immortalising the symbol of tragedy. We do so because are affirming the power of what took place on the cross. The cross did not transform Christ, but, rather, Christ transformed the cross. An instrument of shameful death is made to be the way of life and peace. The tree of death has become the tree of life. But if there is a part of the Passion Narrative that ends in tragedy, it would have to be the ending written for Jesus’ betrayer, Judas Iscariot. The story provides us with a stark contrast between the two Apostles, St Peter, the Lord’s denier, and Judas Iscariot, the Lord’s betrayer, and the consequences of their greatest moment of weakness. It is as if the liturgy invites us to choose – do we follow Judas or Peter? Peter had remorse for what he did, but Judas was also remorseful to the point of crying out, “I have betrayed innocent blood!” and he gave back the thirty pieces of silver. Where is the difference then? Only in one thing: Peter had confidence in the mercy of Christ, and Judas did not! Judas’ greatest sin was not in having betrayed Christ but in having doubted his mercy. Here is what the story of our brother Judas should move us to do: to surrender ourselves to the one who freely forgives, to throw ourselves likewise into the outstretched arms of the Crucified One who reveals to us the Merciful face of the Father. Like Dante’s poem, jokes, satirical movies can and have been made about the Passion of our Lord Jesus Christ, but, also like Dante’s work, it is not a funny story. Like Dante’s poem, the story of the Passion is dramatically absorbing, but neither one is amusing or entertaining. There is no denying that pain, suffering, and death are real. But the good news proclaimed by the events which we commemorate today is this – they need not end in tragedy and there is no need for us to reinforce a sense of false optimism by singing “Always Look on the Bright Side of Life.” Like Dante’s poem, our Lord’s Passion is so much the opposite of a tragedy, that it can only be known as a Divine Comedy. The comedy of Good Friday displays a universe where order ultimately triumphs over chaos, good over evil and where God always has the last word; and that word is life, that word is love, that word is hope. The cross is not tragedy. The cross is life, the cross is love, the cross is hope, our only hope.